So, you'd like to give your baby a leg-up on the competition, nursing is one way to do it. There are a few must-have items I recommend if you are planning to breastfeed your baby. 1. The My Brest Friend Pillow. It will save your back. It is the closest thing to hands-free nursing. If you roll up a flannel recieving blanket and put it under baby's head, you can also easily adjust the angle and tilt of her head. 2. A Double Electric Pump. If you think you can get by without one, you are kidding yourself. 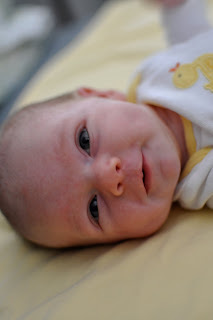 I have the Ameda, but the Medela brand is much more widely used. While initially intimidating, this overpriced air pump will soon become your best friend. 3. A special nursing apron. Once you start feeding your baby, you will soon find out, this is pretty much all you do, all day. After a few weeks of watching your DVR'ed shows, you will become bored. And, you will want to venture out into the world once again. But, if you are feeding your baby every other hour all afternoon, you will not have time for a restaurant, trip to the store, etc... unless you plan on nursing is public. This handy dandy device will make this possible. The lady who invented these booby covers that have a special wire in the top for baby viewing and fresh air, is ingenious. 4. Oatmeal Stout. I heard that drinking beer can help with making milk. I was very keen on trying out this tip. So, I eagerly made a trip to the grocery store to buy some beer. In fact, this was my first outing from the house after coming home with the baby girl. So, every night I treat myself to my "nursing beer." Remember, happy hour starts at 5:00. But if you made it through a whole day of taking care of an infant on your own, you can get away with 4:30. Isla is a little over 1 month old now. During the last couple of weeks she has started to have more alert and happy time during the day, which has been a lot of fun. our Knockout Rose Bushes exploded with gorgeous hot pink blooms. It was amazing. The looked like rose bushes straight out of Alice in Wonderland. Man, it's hard to keep up with Seatsleaf while taking care of a newborn. I did want to post a few photos from the GP visits. The last of the Grandparents left last Friday, with my mom departing after her week in San Antonio. My dad had to leave earlier in the week due to the raging success of his company, Lontai Design LLC. 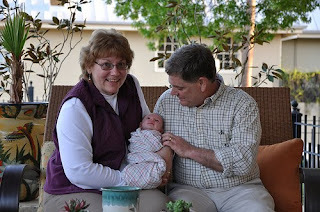 The Grandparents were a great help to us during their visits, and we were well-fed during the 2 weeks. Now we're back to foraging for food again.